Super Lemon Haze is Greenhouse Seeds' award-winning cross between Lemon Skunk and the notorious Super Silver Haze. This medium-tall plant is ideal for equatorial, tropical subtropical and temperate climates. It thrives indoors, flowering in roughly 10 weeks and producing roughly 800 gr/m2. Plants are branchy and wide, making them ideal for SCRoG or LST, however larger plants will need support. Its effects begin with a relaxing Indica stone that quickly moves into a strong sativa high. Described as 'the swiss army knife of Sativas', it is ideal for creativity, mood-enhancement, fatigue reduction and productivity. The one thing it wont help with is insomnia! It is also effective in pain therapy and appetite stimulation. Its sticky, fluffy buds have a strong, sweet, citrus aroma and its taste is like a sweet-but-savoury lemon and butter; it begins with a sharp and intense lemon flavour and finishes with earthy, savoury undertones. An excellent choice if your focus is on flavour specifically. You can buy Greenhouse Seeds' Super Lemon Haze marijuana seeds here at SeedMasters.com! EFFECTS Like the Super Lemon Haze, it has a complex sativa effect, a light body-stoned together with a clear cerebral high. Fast hitter. FLOWERING TIME 7 Weeks - Can be flowered at 18 or 12 hours photoperiod. 9 weeks total crop time. HEIGHT Medium-short plant, good branching. 80-100 cm. total height. A cannabis must for every Indica lover! A F1 mix between White Widow and ICE. This cannabis strain i.. 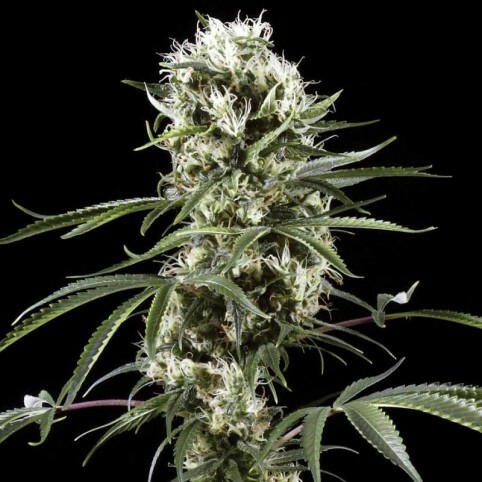 This new enhanced strain of a fruity white sativa is great for losing inhibitions, maintaining a hig..
Wild Thailand Ryder is a cross between a pure strain from the islands of the Ko Chang archipelago (T..
Shark Attack cannabis seeds by Dinafem Seeds belong to a feminized, Indica-dominant cannabis strain ..